Astoria Foot Care Group P.C. Welcome to Astoria Foot Care Group, P.C. The doctors and staff of Astoria Foot Care Group, P.C. located in Astoria, New York would like to welcome you to our web site. As you navigate through the site you will find a wealth of information about podiatry and treatments available. We invite you to call our office with any and all concerns you may have. At Astoria Foot Care Group, we take great pride in treating our patients with that extra bit of care and attention they deserve. From the moment you enter to the completion of the visit, you will be greeted with a sincere smile by the entire office staff. When you make an appointment at the Astoria Foot Care Group, our staff will verify your insurance coverage in advance. We will fully inform you as to which services are covered or “out of pocket”. Our doctors participate with most insurance plans in order to enable you to make full use of all our medical services. Once inside the treatment room, our experienced nursing staff might assist you into one of our four whirlpools, for a relaxing therapeutic treatment prior to the medical care. Our staff is also pleased to assist our disabled or geriatric patients, in removing and reapplying their shoes and socks. 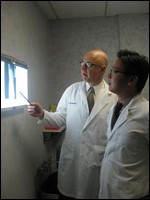 Our two highly experienced doctors make every attempt to give you the highest quality of care. From simple nail problems to complicated reconstructive surgeries, we are committed to addressing your foot care needs. X-rays, ultrasound guided injections, blood tests, anesthesia, laser procedures and hospital or in-office surgery are available to all our patients. We also offer in-office vascular testing for your convenience. This is a pain free exam to diagnose any impairment to the circulation of your lower extremities. Knowing the circulation status to your legs and feet is critical to determining your overall health status. Our office is open six days a week with early morning and later evening hours available. We can accommodate emergency walk-ins or any special needs case the very same day that we are contacted. House calls are also available at one's request. For over 30 years, the doctors of Astoria Foot Care Group have treated generation after generation of patients and their families. We look forward to seeing you soon. -Astoria Foot Care Group, P.C. New York College of Podiatric Medicine, Doctor of Podiatric Medicine, New York, NY, 1981. Queens College, BS Biology, Flushing, NY, 1977. Astoria Foot Care Group, P.C. "I took my 13 son there today. Highly recommended for children. Follow up on Monday." "Dr Mermelstein and his staff are awesome." "Wonderful, patient and extremely responsive. The staff is fantastic and the doctors (I've seen Dr.Mermelstein) is just so caring and encouraging. Highly highly recommend!!!!" "Dr. Mermelstein is an incredible doctor!! I highly recommend Astoria footcare!"